Last weekend was my mum's birthday. Given the ardent foodies my family are, we thought it best to celebrate the occasion with a lovely Sunday lunch. My parents live properly out in the sticks (and by this I mean at least an hour from Central London), and they've found it somewhat challenging to find a good meal that they couldn't do better on themselves in their neighbourhood. Gravetye Manor looked as if it'd fit the bill. Built in 1598, the Manor is surrounded by 35 acres of gardens. We drove up a a path so long and winding we wondered if we were lost. The carpark housed Rolls Royces and Land Rovers and I felt a little under-dressed. Inside the manor we were led towards the back of the house, which opened up to beautiful English country garden. It wasn't over-fussed and manicured like some I've seen before, but it looked well cared for and mature. Taking a seat in the garden, we ordered drinks and were brought canapés. A chilled courgette and basil soup was refreshing. A round of foie gras paté on a biscuit with apricots was silky and luxurious; the fruit cut through the richness nicely. The pictured salmon tartare was my favourite; salmon mixed with dill, sat on a diced cucumber salad topped with roe. A perfect mouthful to whet the appetite. The dining room at Gravetye Manor is smaller than I expected. Wood panelling lines the walls, and footsteps are muffled by heavy carpet. I had a real trial trying to choose what to have, there were a lot of options that appealed to me. In the end, I decided on this starter - Salad of Young Pigeon with Foie Gras. When the dish turned up, it was far bigger than I thought it would be (which is definitely not a criticism). Lobes of foie gras were beautifully caramelised and cut like butter. The breast of pigeon, nestled in the leaves was cooked to medium and had a pleasingly gamey taste. I was unsure as to how the mango would work, but it seems I'm really getting into my fruit and meat combinations as it was delicious. The fresh shiitake mushrooms provided a umami hit - a brilliant start to the meal. The standards kept up for the mains; I went for the English John Dory. This colourful plate contained sweet baby onions, artichoke hearts, cherry tomatoes, carrots and courgettes. I felt positively wholesome eating it. The fish had a deliciously crispy skin, though if I had one criticism I'd say that it was a touch over-salted. The remaining juices were mopped up greedily with some excellent sourdough bread. Other dishes around the table were just as visually appealing. Mum decided to go with two starters instead of a main (much to my consternation; I could very well polish off any leftovers!) 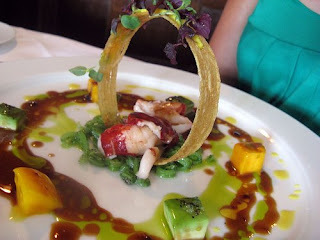 and this warm lobster salad surrounded by a potato hoop brought little gasps of surprise around the table. I did briefly wonder how you're supposed to eat the hoop, but when I resurfaced from inhaling my main course it was all but gone. I didn't even get a look-in on Dad's cannon of lamb; this was eaten with equal gusto. Surprisingly, I decided against the cheese board. I had already walked past it and it was impressively whiffy, but I went for this roasted peach, vanilla pannacotta and vanilla ice cream dessert instead. It sounded light and refreshing, which it was. That crisp wafer of sesame and other seeds that bridges the vanilla ice cream and pannacotta was seriously moreish. Satiated and extremely happy, we retired back to the garden to finish our dessert wines and coffees. Pretty little petit fours arrived which defeated us, and we were left to bask in the afternoon sunshine. When we toddled off to the car we left with a feeling of having been really well fed and well looked after. On consulting our watches, we found we'd been there for four and a half hours. It had flown by. Gravetye Manor may have lost it's Michelin star this year, but given the level of service and the food, it didn't seem that way. At £52 for three courses including at lunch, it is expensive, but I felt it was a lot more than just a meal. The beautiful grounds the manor sits in really add to the experience, and taking aperitifs and digestifs in that country garden was an idyllic setting. Looks like a cracking meal. I went to Gravetye for my Grandmother's 70th birthday about 18 years ago as a little nipper. I just remember it being an old house with a lovely garden... and had no idea it was such a smart restaurant. You've brought a deluge of memories flooding back to me. I often think you'll get a better meal at somewhere that has just lost its star than somewhere that has had one for a while. The desire to win it back produces better cooking, a revamped menu, and greater attention to detail. Chapter One in Bromley is a case in point. That pigeon & foie gras sounds incredible, probably two of my favourite ingredients meshed into one yummily drizzled plate of tasty. I've never heard of this place, I do have a soft spot for old buildings, and if they serve food this good, it's definitely worth a visit! It seems we are both officially addicted to fruit in savoury dishes! It looks bloomin lovely i have to say. Martin you made me laugh out loud with 'a plate of tasty'. Didn't realise this place ever had a star - and I've never heard of it either! Food looks v. impressive. A truly splendid day. I forgot to eat dinner. Gravetye Manor has been on my mental list for ages as it's often mentioned in travel magazines and newspaper supplements. Your review definitely makes me want to visit even more. What a lovely, summery meal. 'Inhaling the main course' - fab. Do you remember what the little green shoots were with pudding? Browners - glad to have inspired some memories. I imagine it's the perfect place for a party. Pete - Good point actually, I didn't think of that. Chapter One is another place we all really like, though we haven't been since they got their star back this year. Martin - Pigeon and foie gras do go really well together, I hadn't thought about it before. Chris - Thanks! I was impressed with the way they served the food too, esp. the lobster salad. Fillyerboots - Hi Pops :) Can you believe we forgot about dinner?! That's never happened before. Kavey - I'm not sure about sausages and tinned peaches...! I'd not seen any reviews of the place, which made it even more of a surprise in all it's loveliness. I've been completely mesmerised by the potato hoop! Your pudding would have been my choice. I can now see why your birthday dinner has to be a little cheaper! I've been meaning to go there for years! I always stay just down the road at The Alexander House, or The Ashdown Park, so I just never get a chance to eat there. Next time you're in the area, go to The George and Dragon in Speldhurst. Wonderful, mostly organic and locally grown food.